The Camino reaches its end. The last part of the English way, having crossed the bridge of the river Tambre runs entirely through the terrain of Santiago de Compostela. They are 16 kilometers in which to savor in every stride, as the pilgrim awaits reaching the city of Santiago and seeing the unmistakable silhouette of the cathedral. Probably the greatest incentive, given that it is a journey with sparse architectural heritage, until obviously entering the heart of the capital of Galicia, which holds historical declaration of Unesco as a world Heritage site for its beauty, monumental integrity and spiritual significance. In terms of terrain, it is moderately difficult, although short in distance. The pilgrim steps on asphalt and earthy tracks until the last four kilometres, when they arrive at the centre of Santiago through its urban roads. A few moderate slopes test the legs after of walking, while not lacking in shade or shelter to regain strength. Nor is there a lack of refreshment points, which are found close to the national road, parallel to the Jacobean route. The final stage of the journey on the English Camino begins in Sigüeiro, capital of Oroso. In the absence of shelter or other public facilities due to an economic conflict between Administrations, the pilgrim begins the route from any of the accommodations establishments of the town, where bars of the N-550 road open very early to provide breakfast. In any case, the starting point is located in the small town center, acceptably equipped with facilities and basic services, although only one of the central establishments offers beds (Pensión Hermanos Miras). Having just started the step you cross the medieval bridge (XIII century) over the river Tambre. Immediately turning left, next to the tobacco shop you encounter a slight slope leading to the church of San Andrés de Barciela and a cemetery, in the hamlet of Albeanas. The route continues parallel to the river’s course to a track that is taken on the right. After climbing a slope without much importance, the path, still of asphalt, comes to a fork in front of an old stone wall. Turn left and then cross the road AC-250 to enter an area of ​​forest along wide dirt road with stones. Difficult at the start with a steep climb, and no road signs. However, later on successive crossings in the network of forest tracks are visibly marked. The path runs parallel to the motorway AP-9, until it crosses an underpass that, on rainy days, can be very muddy. Next, a brief stretch on a paved road passes along a group of houses, but thereupon enters into another forest track to reach Marantes, near the national road. There is a bar and a hotel (Hotel San Vicente), but to reach them you will be diverted about 300 metres (right) from the Jacobean layout. 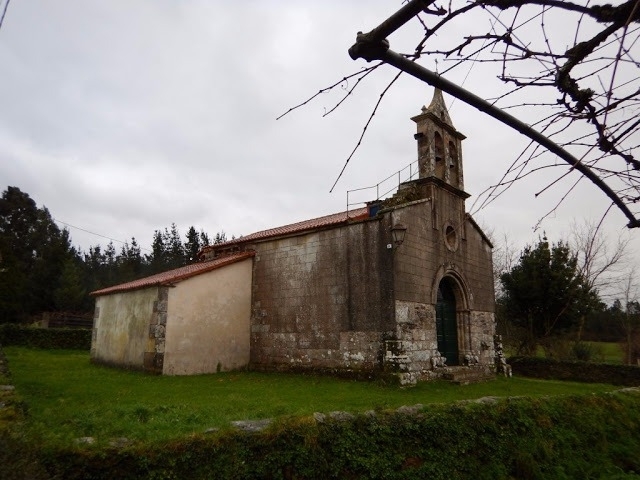 Still parallel to the N-550 road, you reach the cross and chapel of Nuestra Señora de Agualada. From this small temple you can already see the national road which continues the route for 100 metres. Although the signal indicates that the Camino is at the other side of the road, it is not necessary to cross over, given that the path deviates to another path on the left side of the national road. You cross via an underground pass that leads to a mill, close to the well known Fuente del Inglés (the Englishman’s fountain) (10 kilometres to the Cathedral). Inmediately you turn left, parallel again to national road, although now on the left of the pilgrim, with earthy ground. The original Jacobean route which practically follows the line of the N-550 road was modified in 2012, so the milestones now indicate a new route until reaching the industrial estate of Tambre. The new route of the Camino continues along earthy tacks, under the railway brigde line and over the small river Sionlla, passing later trough O Barral. You then reach the industrial area of Garabal road, that lead to Vial of Galileo road, now inside the industrial state of Tambre, a stretch of little or no visual reward, but rather the final sprint to the well awaited and beautiful Compostela. On reaching the business area the traveller comes to Café Bar Polígono, where breakfast and lunch are served at a good price. It also has a drinks vending machines at the door. From there you cross the industrial area in a straight line, over two roundabouts, until passing in front of the walled cemetery of Santiago, from here begins the Rúa das Mulas street. The journey later comes to Rúa Tambre street. At its junction there are bars and steak houses. A few steps ahead on the right, there is a chemist. It is the entrance to the urban area of ​​Compostela and now only some 500 hundred metres separate the pilgrim from the Cathedral. The new location of milestones, previously mentioned, implies that there has been a deviation from the original route, that ran through Meixonfrio where there used to be a refreshments point for pilgrims and travelers. But continuing on the current route, you leave Rúa Tambre street by turning right onto Rúa do Río street. It is a residential area with streets arranged in a form of a grid, it is not necessary to enter any of the streets, rather you should go up a slope of 100 metres to immediately later turn left, bypassing the urbanization along Rúa Camiño do Vilares street. Continuing down a moderate slope, the pilgrim can finally make out the temple’s profile, less than two kilometres in distance. A quick left turn guides you along Rúa Guadalupe street to some steps, next to the Ponte Mantible, a medieval aqueduct ordered to be built by Archbishop Diego de Xelmírez in the XII century to ensure that pilgrims and traders arriving in the city would have enough water. Crossing the park Fermín Bouza via a path you reach Castelao Avenue, in the vicinity of San Caetano, the Galician administrative seat of government, and the monument to The Pilgrim by sculptor José María Acuña. 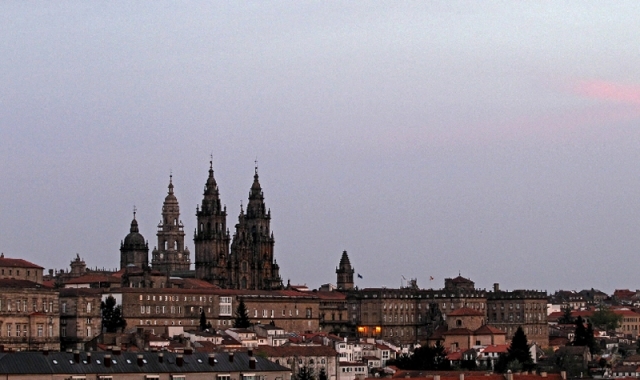 From Castelao Avenue turn right onto Avenue Rúa Xoan XXIII until San Francisco (left) to enter at last the square of Obradoiro, at the foot of the magnificent Cathedral of Santiago. It's the end of the Camino, but there is much more to discover in the city, but not before fulfilling the ritual stop at the imposing temple, validating the well earned credential of Compostela and embrace the Apostle, at the main altar of the Cathedral. 1 reviews Distance to Santiago: 16 km.